Discussion in 'Scenery, Props, and Rigging' started by Tony2018, Jan 9, 2018. Hello, I'm new here. Happy new year!! I have been reading some threads on the forum and there is alot of good information and advice so I decided to post here for information. I hope this is the right place. They no longer sell and only rent it out. I am in Africa and will use it for an extended period, renting is out of the question and beyond my budget. The arm will rotate around the center platform/stage. The speed at which the arm revolves around the center is approximately 15 rpms. The cameras to be attached may weigh up to 15 lbs. ( This is an approximation). But it could be as small and light as a smartphone. What I really want to know is what type of motor might be suitable to rotate the arm which on one side has the camera attached and counterweights on the other. How would the motor be installed in order to revolve the arm around the center. I guess the real question is do you actually need that device? Its really easy to build a castered platform with a center pivot and turn the subject while the camera is fixed on a tripod. Do you actually need the camera to move? 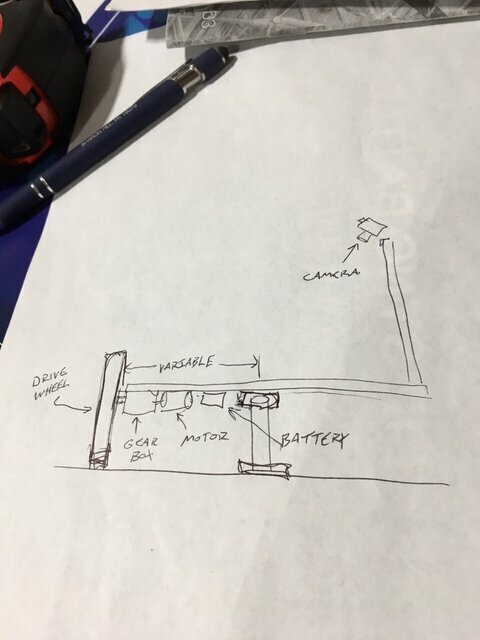 But you got me thinking, so here's my napkin sketch idea: Assuming you get a fixed speed DC motor (cheaper than variable, no controller) and a battery. This won't work with remote power unless you get commutators involved. The cool part here is the drive arm. The arm with the drive wheel is variable length (think 1" tube slid over 3/4" tube with a set screw or something to lock it in place). This lets you adjust the rpm of the system by sliding the arm in and out. Thanks for your reply. I see what you are saying. The configuration I explained, same as the device in the picture is for the camera moving around the subject rather than the camera being stationary and the subject spinning. It's a totally different look. However there is a way to make one device perform both movement i.e the subject spinning as well as the camera revolve around the subject, either simultaneously or independently ( clockwise or anti clock wise). Wow, thanks alot for the information and the drawing. But I'm not very technical. I still can't quite understand how the motor will make the arm revolve around the center/subject. Hmmm.... maybe this is beyond my scope. But I understand what you are saying. I will try and translate what you said and Drew into a sketch up model... perhaps it will be easier to for me to visualize if I can see it from different perspectives. I will get back to you after studying it a bit more. Will a DC motor be strong enough to make the arm revolve? There will be couterweight on the opposite end of the arm ( camera in onside...counter weight on the other). Any recommendations for DC motor? Can there be a wired controller to start and stop the motor? It would be great if the RPM was totally contorolled via the motor which would be controlled by a wired remote. Motor would power a drive wheel that rolls on the floor (or whatever sub base this machine will sit on). This is just me spitballing an idea that would get you variable speed without having to buy a separate controller for the motor (mechanical solution vs electrical solution). If you want to control everything with the press of a button, you're going to start spending more money. Aahhh...I see what you mean with the drive wheel, quiet ingenious. So with that there is no need for counterweights? But that would induce noise and vibration. I dont mind using a beefier motor. The arm's revolving movement should be buttersmooth. Excess vibration or bumpy movement would be bad for the footage recorded. With a configuration like orcavue what kind if motor donyou recommend? Any links where I can read more about that type of motor? Orcavue seem to use Ac power input, but that maybe to recharge the battery. My budget is upto $3000, it's a little steep...but I think if I can nail the design, configuration, I can eventually find ways to reduce the cost with alternative parts. Here's cool super-duper homemade rig. Intended for time-lapse, may not be steady enough for live video. That is awesome. Nice work with the gears. The motor is so small but does the job. Thanks for the share. I came across this site. They sell different kinds of motors. Do you think these have enough torque to revolve the arm with camera and counter weights? Any update regarding this topic? Tony1218, I have done many product shots involving rotating products, and I can confirm that, assuming that your shot contains NOTHING except the product and the "disc" it is set on, there will be no difference to the viewer of the footage whether the camera is revolving CCW around the product or the product is rotating CW in front of the camera. If the "product disc" rotates CCW and the camera revolves CW, it will look exactly the same to the viewer of the footage as a static camera and a faster disc/product rotational speed. What is the duration of the shot that you need? It's easy to make a turntable and rotate it by hand, using a static camera, if your shot isn't over a minute or so. Well, depending on the other constraints you have to live up to, consider the idea of *flying* the camera spinner from the top; that relieves you of lots of necessary ruggedness at the bottom -- you can just put them on the floor, or a fixed pedestal. Well. . . the lighting would be different. Either it would stay the same relative to the object and change relative to the camera, or vice-versa. Granted, if using very flat soft-box lighting, this may not be noticeable.